You have the switch line return short on the negative in other words one of those black should have been marked as a red that then goes to the brown of your light. You will need two extra connectors please connect all the earths together they shouldn’t be sitting on their own! Just to add to @Happypin's post above. Reds are the ring main - they should be connected to each other but not to your light. You'll need to find the switch wire. You should add some brown or red tape to it to indicate it is the switched live. It should be one of the blacks... That connects to your brown light wire. Connect the others blacks together and to your blue. Are you sure cuz there are 3 reds and 3 blacks? Yep - electricity in (1 red + 1 black), electricity out to the next light in the ring (1 red + 1 black), plus the switch line - 1 red + black . The red goes from "electricity in" to the switch, the black is connected to the other side of the switch and then back to the light. So the switch live return is actually black. If so you’ll need to switch the power off and find out which pair is the switch cable as you have no markings to tell. You can check this by putting continuity on the red and black or each pair and switching the switch on. A dead short beep when switched on between red and black will tell you which is the switch cable. Then, all reds in a separate block and two neutral blacks in the neutral on the light and the switch live black, the one you just tested, into the live on the light. 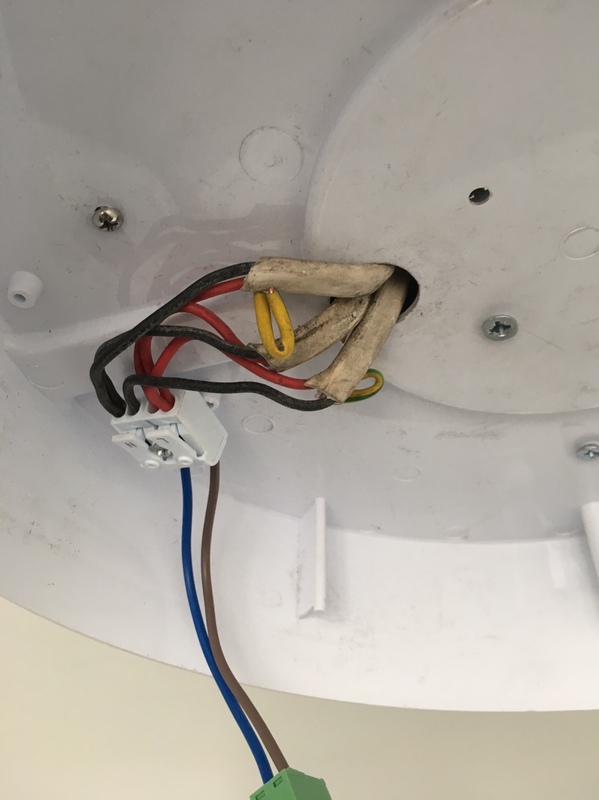 This is the most common thing on a diy light change. I’m local to you so if you need a hand let me know. This is why I call in an electrician. If this had been me I'd not only have blown the fuse and LEDs but probably killed myself as well. If you do call a electrician the first thing he/ she will do is change the fuse board ,then do the job you called him to do plus you will get a nice certificate at the end of it .